How to Backup & Restore Samsung Galaxy S9/S8/S7 Edge/S6/Note 7/6/5? Have you ever encountered the situations of losing important data from your Samsung mobile phone? I know it would be a quite bitter and terrible experience to find that all crucial data in your mobile phone are wiped somehow or other. Data on your Samsung phone can be lost due to various reasons, not to mention deleting data on Samsung phone by mistake, restoring your phone back to factory settings or formatting the phone, even downloading and installing virulent applications can wipe away your phone data. Therefore, doing regular backup for your Samsung phone is impending and essential. We are going to share you with two different solutions to backup and restore your Samsung S9/S8/S7/S6. Are you one of the people who would like to backup all the contents on your Samsung mobile phone to a computer in case that you may delete or lose them out of carelessness? After all, it is wise to take preventive measures. However, it is not easy to do Samsung Galaxy mobile phone backup and restore. To accomplish that, you need to draw support from a third-party tool like Coolmuster Android Assistant (for all Windows versions) or Coolmuster Android Assistant for Mac (OS X 10.10 or later), which allows you to back up everything, including photos, videos, contacts, SMS, apps, etc. from your Samsung to computer and restore the backup files back to your Samsung or other Android devices as you like. How to backup Android to SD Card? How to Backup Samsung to Cloud? Download the free trial version of the Android Assistant to backup and restore your Samsung Galaxy S9, S8, S7, S7 Edge, S6, S5, S4 or Note 7, Note 6, Note 5, Note 4, Note 3, Note 2. Just choose the right version according to your situation. Then, you can read the guide given below that is focused on the Windows version. For this Mac users, you can also refer to the steps below. After installing and launching the program on your computer, connect your Samsung phone with this computer by using a USB cable. You may be asked to enable the USB debugging on your Samsung phone. When the USB debugging is enabled, click "Allow" on your phone to allow the program super user authorization when an Superuser Request pops up. After enabling the USB debugging on your Samsung phone, Android Assistant will detect the Samsung device and show you its main interface, just like the following picture. Choose "Super Toolkit" from top menu. 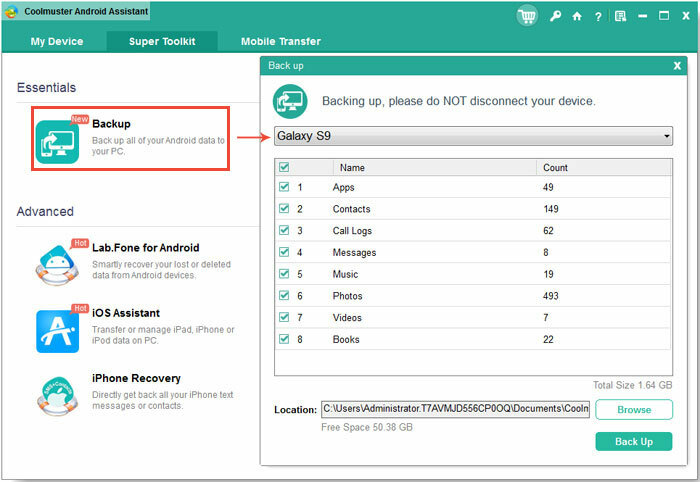 Choose "Backup" option and all your Samsung phone data are scanned automatically and listed in different categories, such as Music, Videos, Photos, Contacts, Apps, Books, etc. Select the target files and click the button of "Back Up" to transfer them all to your computer for backup. You can click Browse button to customize the file location to save the backup file. When the backup is done, you can restore them in the future. Next time if you would like restore the backup files, you can click the option of "Restore" and all backup records will be displayed here for your choice. 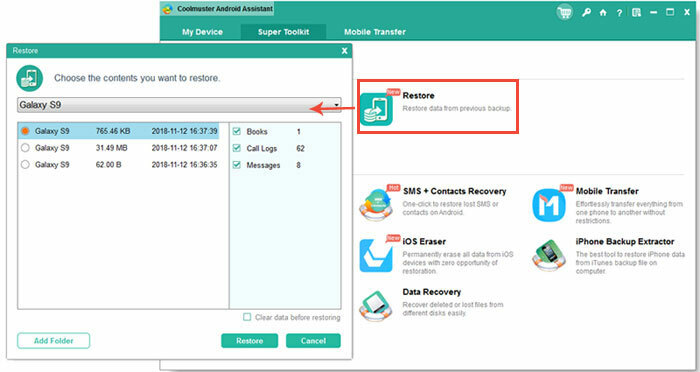 Just choose your wanted backup record to click "Restore" button to get them back to your Samsung phone. Note: If you have ever changed the location of the backup file, the backup content would not show up in the list. You need to click "Add Folder" button to find the backup folder manually. 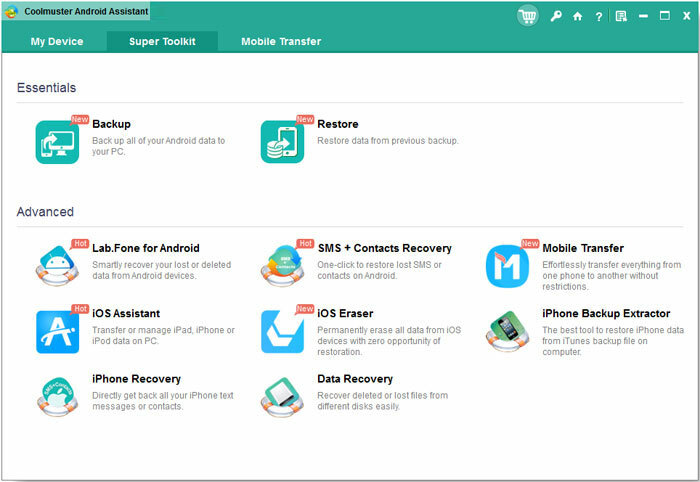 We also have another tool to help you backup your Samsung Galaxy device to computer and restore the backup data from computer to your Samsung or other phone. The name of the tool is Coolmuster Mobile Transfer or Mobile Transfer for Mac, which is not only a professional phone to phone transferring tool, but also a phone backup and restore tool that enables you to transfer your phone data, including contacts, text messages, photos, videos, music, apps and etc. to computer for backup. and restore the backup file back to your phone with one click. Tips: Here are also some useful guides to teach you how to import and export Android contacts, backup and restore HTC phone. Backup: Navigate to the main interface of the program and choose "Backup on Computer" option. Then, all the transferable data on your Samsung is displayed and categorized here. Select the file types you want to backup and click the "Start" button to begin the backup process. Restore: Choose "Restore to Phone" option from the main interface and you will enter the restore window. All the backup files on your computer will be displayed here on the program window. Just select the backup record you want to import to your Samsung Galaxy phone and click the "Start" button.